Immigration, Refugees and Citizenship (IRCC, formerly known as CIC) released an annual report, highlighting the most immigrant-favorite provinces of Canada, which also reveals the data of applications received by various provinces of Canada from 1st January 2015 to 3rd January 2016. 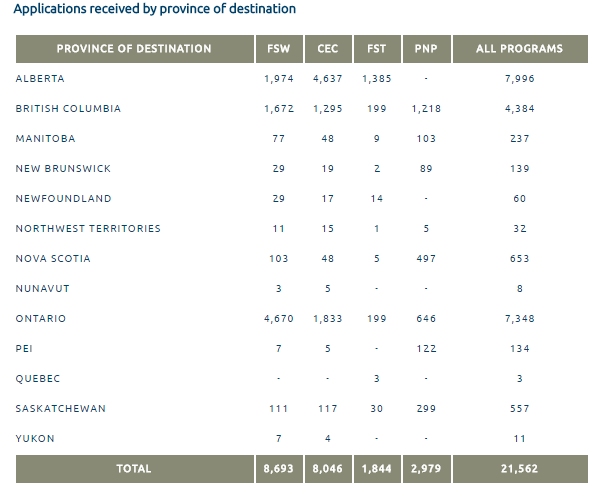 During the year 2015, IRCC received a total of 21,562 permanent residence applications from candidates who were invited to apply during the invitation rounds, with an additional 15,862 family members joining principal applicants on applications (making a total of 37,424 applicants and their family members). By the beginning of the year 2016, a total of 14,058 applications had been approved. The overall results show that over 13,241 visas have been issued to principal applicants and their dependents, and about 9,739 applicants have already landed in Canada. As of the reports, Alberta is marked as the most popular province of Canada, which has happened to attract a huge number of immigrants. Statistics show that over 7,996 applications were received by the province, and 58% of the applicants who chose Alberta province were invited to apply for Canadian Experience Class (CEC). Besides Alberta, Ontario (7,348 overall applications) and British Columbia (4,384 overall applications) also makeup to be the most popular provinces, by having received a good number of applications. The country expects that Ontario and British Columbia will progressively attract significant numbers of migrants as both the provinces have flourishing economies with diverse living culture, which indeed makes them homelike.